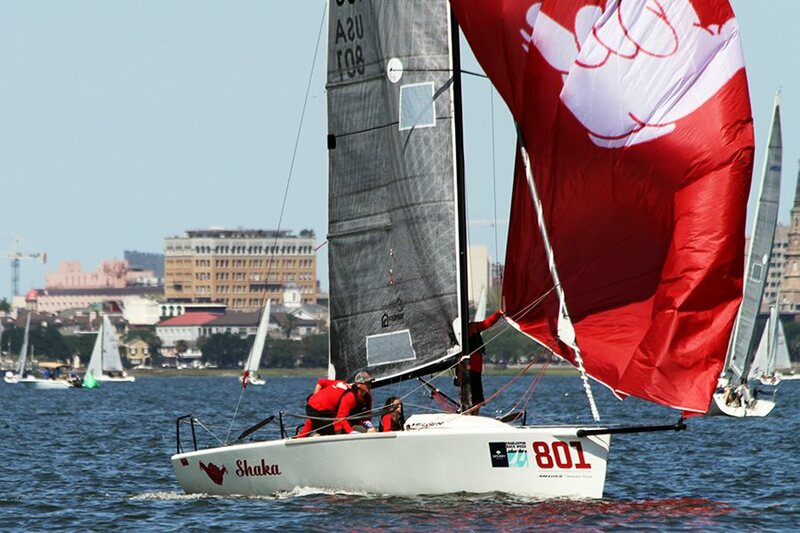 Shaka's red, hang-loose spinnaker is a Corinthian favorite on the Melges 24 racecourse. We spoke with KC Shannon to learn more about his program and the secrets behind its Melges 24 National Corinthian Championship title and its overall success. Smooth Sailing - KC Shannon sails with Shaka, his 2017 Melges 24 US National Corinthian Champion team at the 2017 Sperry Charleston Race Week. Originally I chose the class based on the number of boats currently racing at Lake Lanier Sailing Club. I believe we had 7-8 boats racing regularly back then and now we're up to 13. 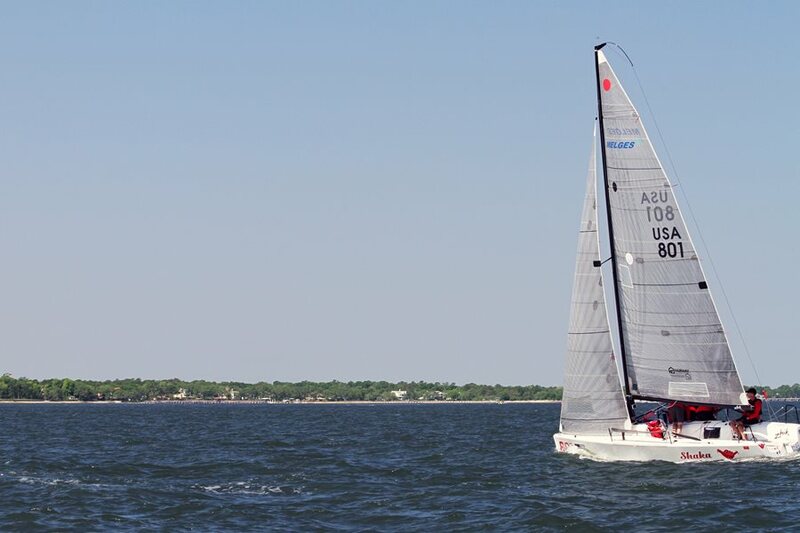 The Melges 24 sails very well in all conditions; including what we see most during Wednesday night racing; light air. The competition is fierce on the lake and it has made for great events throughout the calendar. The thrills only increase when the breeze comes on and the boat is in its happy place: planing conditions. The level of competition is what I love most - whether on the lake or at any of the incredible regatta venues we've traveled to over the years, the competition is very high. A podium finish in the overall or Corinthian division is a coveted spot at any event. Time on the water for Corinthian teams like Shaka, often competing with different crews based on family/work schedules is very challenging. We've used GoPro video footage for training in the past and we often refer back to these before each regatta for pre-game briefs plus they're always fun to watch! Of course, nothing beats time on the water together so whoever makes us Team Shaka for the regatta, we try and get there a day or two early to tune up other top Quantum Sails teams like Jaws (Corinthian), Decorum (Corinthian) and Zingara. Learning to change gears in the all the conditions we see is a constant lesson in the Melges 24; we never stop learning. Execution of each maneuver means gains or losses in boat-lengths against the competition. One of our biggest challenges as a team is always our consistency of execution. We hope that work/family schedules allow us to travel the boat and compete in San Francisco in September to defend our US Nationals title! We attended each Quantum Sails debrief conducted at each regatta we participated in and kept a book onboard with notes that included the day's conditions, our rig set up, etc. We followed the Quantum Melges 24 tuning guide to the letter and it helped us beyond measure. I can't overstate how impactful this was to have this laminated and onboard for each race. We set up Shaka identically to top Quantum Melges 24 boats so that we could ask questions, compare notes, etc. We figured if we mirrored set ups as best we could that we'd learn from our execution mistakes and improve; it had an immediate impact to our results. I am still extremely proud and amazed by the fact that we won the 2017 US National Championship in Charleston. We can't wait to go back to Charleston Race Week; one of the team's favorite events for sure. As a Corinthian team, what are you tips for being competitive against the rest of the fleet? Follow the tuning guide to the letter; understand that there are no magic numbers that make the pro teams faster - it's all about execution. Spend as much time on the water with your team members, including those that sub in for different events - practicing all the takedowns, starts, tacks/gybes, communication, penalty turns, etc. It pays off both at home and out of town. Sharing the GoPro videos has been a great way to keep everyone on the team involved – it is fun to share these with our family, friends and co-workers; even those that may not sail - yet! April 1, 2017 we are racing in the Commissioning regatta and are noticeably slower than the boats around us. Tommy, our boat boss, says he sees something black on the keel bulb - I'm thinking to myself it's April Fools and I'm not buying it. My son, Connor confirms the worst - I've forgotten to remove the bulb cover. The water is beyond frigid and truly takes my breath away as I strip down to underwear and go for a dive; needless to say, I'll never forget to take off the bulb cover before we go sailing again! The other lesson is to have someone else go in the water! Hang Loose - This fun-loving approach to sailing is a big part of Shaka's success. (Above) KC Shannon sails with team Shaka at the 2017 Sperry Charleston Race Week. Shaka was originally named for Shaka Zulu - one the previous owners hailed from South Africa. I wanted to change the name right away up until I did a Google search for Shaka and saw the hang-loose symbol. I've watched countless videos of Melges 24 in planing conditions and one thing that's present in all of them no matter the country being sailed in - the Shaka symbol goes hand in hand with grinning from ear to ear when the boats are planing. What's is your advice to a class that is new to the class or for other teams trying to be successful? Do your best to sail with the same crewmembers each time out - try and commit to a year's campaign as a team. Stick with the same positions on the boat. Tune with other teams before each event. Follow the Quantum Sails tuning guide. Ask questions of your Quantum Sails rep - they are more than willing to help your team improve.